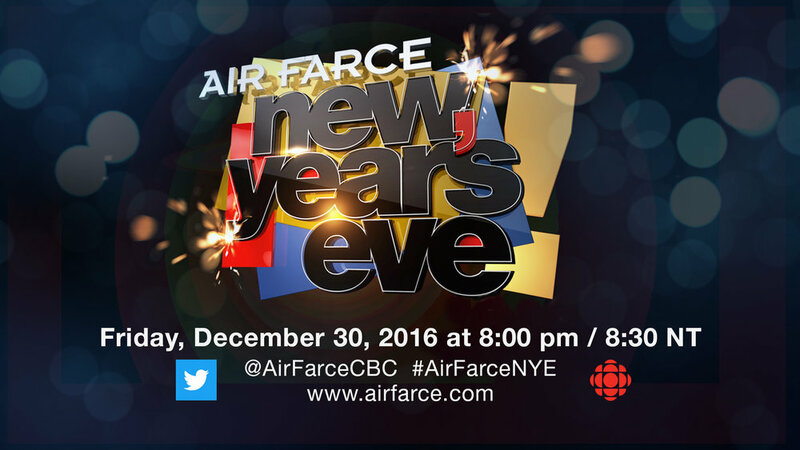 START YOUR NEW YEAR'S EVE CELEBRATIONS WITH AIR FARCE ON CBC! AIR FARCE, one of the most acclaimed homegrown comedy troupes, is celebrating its landmark 45th anniversary skewering the biggest news stories, events, people, and pop culture phenomena of the year with its longstanding year-end ritual AIR FARCE NEW YEAR’S EVE, premiering Monday, December 31, 2018 at 8:00 PM (8:30 NT) on CBC, with an encore broadcast later the same evening at 12:10 AM (12:40 NT). Join founding troupers Don Ferguson and Luba Goy, longtime cast members Jessica Holmes and Craig Lauzon, and recent recruits Darryl Hinds, Isabel Kanaan, and Chris Wilson, along with this year’s very special guests: comedian and cannabis rights activist Tommy Chong; actress Lauren Lee Smith, star of CBC’s Frankie Drake Mysteries; and hockey champion Natalie Spooner, the first woman in hockey history to claim the gold medal at the Olympic Winter Games and the Clarkson Cup in the same year … plus special appearances from Lisa Michelle Cornelius, Nigel Downer, and Kevin Vidal. Join us as we look back at the year that was and takes aim at climate change, the fallout of the #MeToo movement, Brexit, the Trans Mountain Pipeline, the legalization of marijuana and the Queen welcoming a new royal great-grandchild. Black Panther battles America’s latest threat – extreme racism – and PM Justin Trudeau is #sorrynotsorry in a special musical tribute set to Maroon 5 chart-topper Girls Like You. And, of course, to cap off the special, we roll out the F-BOMB on the top five most irritating targets of 2018. Tommy Chong stops by CBC Radio’s Cross Country Checkup to explain the new cannibis laws to Craig Lauzon (as host Duncan McCue) and Jessica Holmes. A Netflix night in becomes problematic when the girls realize that most mainstream movies and TV shows have been tainted by their scandal-prone stars. Featuring special guest Lauren Lee Smith from Frankie Drake Mysteries. 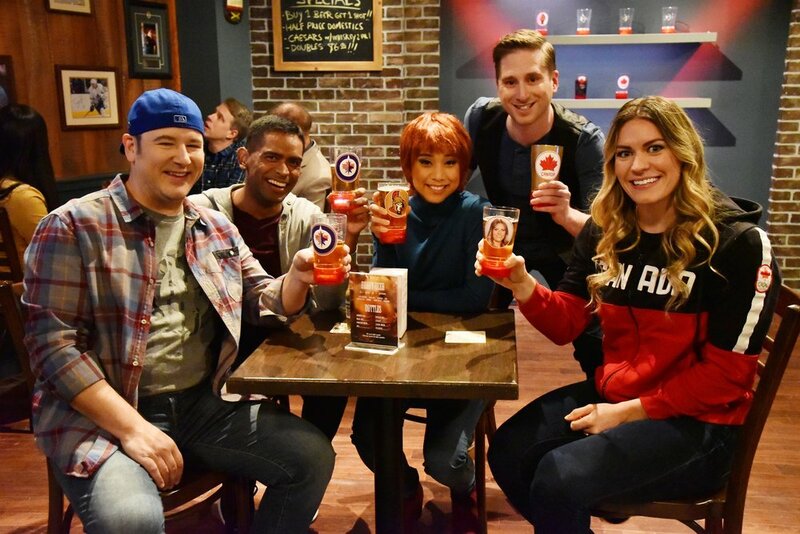 In a very special guest appearance, Canadian Olympian Natalie Spooner stops by a neighbourhood bar to stick-handle questions from some die-hard sports fans. Black Panther returns from Wakanda to save America, featuring guest performers Lisa Michelle Cornelius (as Okoye), Kevin Vidal (as Childish Gambino), and Nigel Downer (as Colin Kaepernick). RE-WATCH OUR MOST RECENT SPECIALS BELOW! • Learn more about AIR FARCE NEW YEAR'S EVE 2017 here. • If you missed the show or want to watch it again, click here to stream it online and on-demand for free! VIDEO: Wonder Woman (new AIR FARCE cast member Lisa Gilroy) fights her biggest (and most sexist) adversary yet, Fake President Donald J. Trump (Craig Lauzon), with Robert Mueller (Don Ferguson) and Kellyanne Conway (Jessica Holmes). In preparation for the 2018 Winter Olympics in South Korea, North Korean leader Kim Jong-un (Isabel Kanaan, centre) gets some last-minute training from Dennis Rodman (Darryl Hinds) and special guest Kurt Browning. Also featuring special guest Lloyd Robertson (not pictured). VIDEO: Tim Hortons introduces a special new blend of coffee which features Canadians' deepest, darkest secrets. For when dark roast just isn't dark enough... Featuring Luba Goy, Criag Lauzon, Chris Wilson, Jessica Holmes, and Darryl Hinds. 150 YEARS OF LAUGHS ON AIR FARCE CANADA 150! What’s more Canadian than AIR FARCE, eh? AIR FARCE CANADA 150 pulled out all the stops for the country’s 150th birthday, capturing the patriotic spirit of Canada’s sesquicentennial celebrations in 60 funny, fast-paced minutes. And for the first time in AIR FARCE history, the whole country came together to watch at the exact same time! • Learn more about AIR FARCE CANADA 150 here. VIDEO: Los Angeles is beautiful at night, but Canada has universal healthcare. AIR FARCE presents a Canadian take on La La Land. Featuring Jessica Holmes, Chris Wilson, Darryl Hinds, Craig Lauzon, Emma Hunter, and Isabel Kanaan. VIDEO: Did you know the Vikings landed in Newfoundland? Enjoy this very real Canadian history lesson from Air Farce. Featuring Chris Wilson, Emma Hunter, Isabel Kanaan, Craig Lauzon, Darryl Hinds, Don Ferguson, and Luba Goy. TWO MILLION CANADIANS CELEBRATED THE ARRIVAL OF 2017 WITH AIR FARCE! Thank you to everybody who watched AIR FARCE NEW YEAR'S EVE 2016 on CBC! Whether it was our early premiere on Friday, December 30, our special broadcast after the hockey game on New Year's Eve, or our New Year's Day repeat, we're thrilled that over two million Canadians made AIR FARCE part of their New Year's plans! • Learn more about AIR FARCE NEW YEAR'S EVE 2016 here. click here to stream it online and on-demand for free! VIDEO: Hillary Clinton (Luba Goy) finds Stranger Things even stranger than the U.S. election (with Craig Lauzon, Emma Hunter, Jessica Holmes). VIDEO: Rihanna (Aisha Alfa) just wants Sophie (Jessica Holmes) and Justin Trudeau (Craig Lauzon) to get to "Work."